Hi, great 1st job. I like to live on the edge at times and I'm using the 'Trunk' builds. I've noticed that the RSS indicator in the 'status-bar' does not show. Not sure if its the theme or changes that are being made to the 'Trunk' as we progress toward version 1.1 in late March. Also...are there supposed to be 'throbbers' on the tabs during loading in background? If so, they are not showing up on the tabs. update: I disabled Mini-T extension, TAb Broswer Pref's, Unclose Tab, and Installed a new Extension Called Tab Mix, and now I see the 'throbbers' on tabs. So, my priior report is related to an extension. This is a very good-looking theme, thank you! E.g. 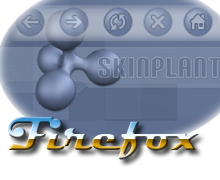 window.open( "test.html", "testwindow", "toolbar=yes" ) works, while window.open( "test.html", "testwindow", "toolbar=no" ) will crash Firefox while using the SkinPlant theme. I'm happy.. finally a firefox section... guys.. keep posting new skins.. lets rock this section!! Awesome theme, just 3 small issues. The text for tabs loaded in background is white, which doesn't show up very well on the light colored tabs. It's fine once you click on the tab, but it's nice to be able to read it before you do so. The other issue is the drop markers on the back and forward buttons. If you click on them, the browser shifts down. This happens with many themes, so it's probably something simple to fix. Check out the Mozillazine forums for advice. Last issue is the lack of support for the Compact Menu extension. I can still use the compact menu by clicking on the space where it belongs, but not having an icon there is weird. Thanks a lot! I have to say this is the best one here!! The only thing I'm not crazy about is the progress bar, I think that should have been left alone! Otherwise, nice job on it bud!! Nicer Icons would be a great addition to this great theme. The standard ones look so out of place. I like the progress bars, the cute ones in the tabs and the ones in the downloads, so nice. I love this theme because it nicely compliments the WB theme. I am using the latest nightly build of Firefox. Any planned update to support the new (again) theme format? I give it a look what I get the GA release on my system. I don't believe I didn't really comment on this. Did you do the 3d object? If you did, what did you use? - but , how do I get it? These ".jar" files is new to me. Just want to find out if you plan on updating my favorite Fx skin so it's compatible with v1.5. This is the only theme I've used (through numerous Fx updates) since you put it on this site; sure would be nice to get it back. For me, Fx just doesn't feel right without it and I'm sure there's many others that share my sentiments on this. Any chance the author will update this skin for v1.5 compatibility? i just downloaded this ....... so how do u exacty get it to work? i tried draging and droping it into my browser and it didnt work. so wut do i do?